FOURTEEN-year-old KRISTY BRADY knows a thing or two about talent quests. She boasts 23 trophies of her own to prove it. This Sunday, July 11, and the following Sunday, July 18, Brady has organised a talent quest at Heaton Birmingham Gardens Bowling Club for children aged six to 13 and children 14 to 17. She has 16 contestants for her STAIRCASE TO STARDOM vocal talent quest, but is looking for at least that many more again, and at least 40 in total. Cash prizes of $50 (first), $40 (second) and $30 (third) plus trophies are on offer to juniors and $80 (first), $50 (second) and $40 (third) plus a trophy for seniors. The Year 9 student performed solo at the HUNTER SCHOOLS SPECTACULAR, last year performing the evergreen TAN SHOES AND PINK SHOE LACES. The year before she performed PERFECT by ALANIS MORRISSETTE and SPICE UP YOUR LIFE by THE SPICE GIRLS in a group. 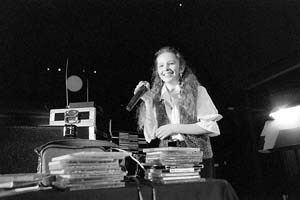 'I was singing for a friend (at the club) and they asked me to come back and do discos,' she said. The vocalist, who attends HUNTER SPORTS HIGH SCHOOL at Gateshead, has been questing for 2 years and has won a few $500 quests locally. She hopes the experience of running a talent quest will help her build skills for a career in the entertainment industry.